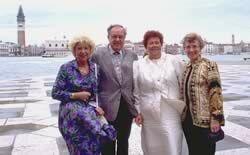 The World Congress of Feline Associations, Venice, Italy, March, 1994. From left to right: Anneliese Hackmann of the WCF, Don Williams of the CFA, Alva Uddin of FIFe, and Brenda Wolstenholme of the GCCF. The Italian cat club (Associazione Felina Italiana) organized the World Congress of Feline Associations, which was held in Venice in June 1994. The purpose of the congress was to promote better understanding and cooperation among the world's various cat associations in matters of mutual interest and concern such as cat legislation and feline welfare which affects all cat lovers, from the pedigree breeder to the pet owner. Besides then FIFe President, Alva Uddin, this first meeting of heads of world cat associations was attended by presidents of cat clubs from the United States—Don Williams of the Cat Fanciers' Association (CFA); the UK—Brenda Wolstenholme of the Governing Council of the Cat Fancy (GCCF); and Europe—Anneliese Hackmann of the World Cat Federation (WCF). The World Cat Congress has since evolved into a full-fledged institution. In March, 1999 a charter was established setting out the WCC's aims and objectives, membership requirements, the structure of its meetings, and funding. A full constitution was drawn up in September, 2003, to further underscore the desire of the member organisations to unite the cat fancy worldwide. The World Cat Congress has its own website.